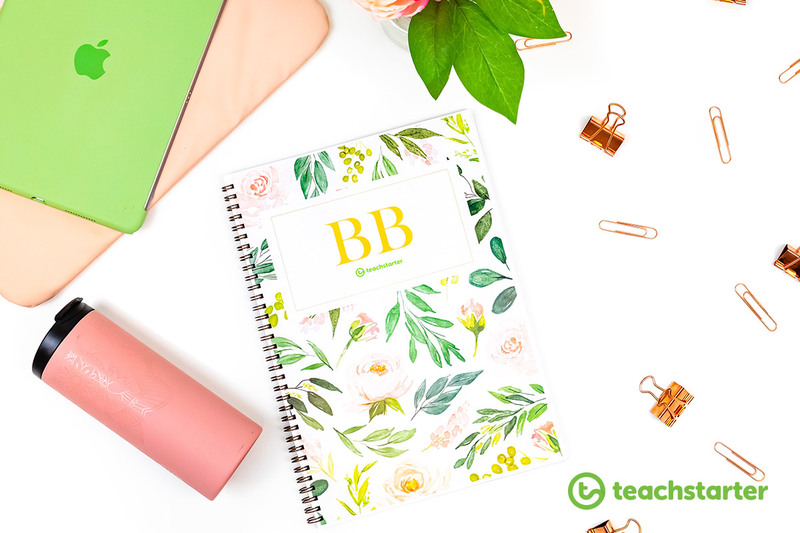 Blush Blooms | How to Assemble Your Best Teacher Planner Ever! Teachers, you’re an organised bunch and you love yourselves a bit of blush pink and golden goodness! If you haven’t spotted it on the website yet, Blush Blooms is a soft, pastel watercolour design inspired by peonies and eucalyptus leaves. But don’t only judge Blush Blooms by its beautiful cover; this stunner is also practically designed with teachers in mind! 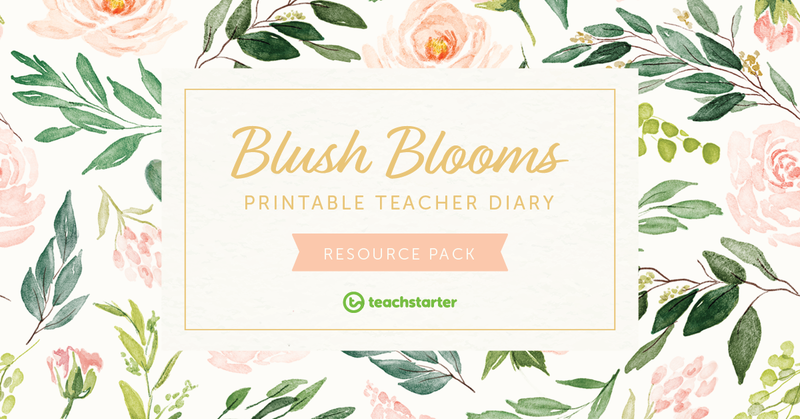 What Do I Get In the Blush Blooms Teacher Diary Resource Pack? You can download these resources separately by clicking the hyperlinks on the resource pack page, or just grab the whole pack in one go by clicking download at the top of the same page! 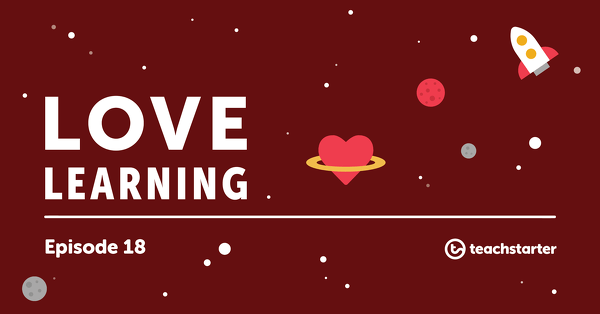 I’m going to step you through everything you need to know to build your best teacher planner ever in 2019! How to Assemble Your Best Teacher Planner Ever! 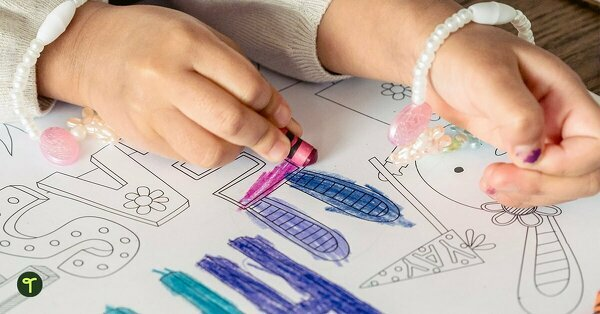 One of the things that makes Blush Blooms your best teacher planner ever is the fact that you can fully customize it to suit your needs and preferences. Love everything to be in portrait orientation? Go for it! Prefer lined note paper over blank pages? Be our guest! Do you love to plan extensive daily plans, or are you more of a weekly overview-lover? Your choice! Everything about your planner is entirely up to you! I’m just here to show your the possibilities. Set your printer to print at actual size, because our designer has created this resource to fit perfectly on letter paper with this setting. I printed my planner on a laser printer, with varied paper weights (240GSM card for the covers and term dividers, regular copy paper for the rest). Laser printers will give a light sheen, while inkjets will give a matte finish. The editable teacher planner cover is my favorite element of the Blush Blooms Diary! If you love the look of it as-is, with Planner written on the front in soft gold script, just download it as a PDF file and print! If you’d like to personalize your diary to truly make it your best teacher planner ever, download and open your file as an editable Word document. Simply click on the text box, delete “Planner” and type whatever you’d like! You’ll notice the teacher planner front and back cover contains three pages – a front cover, inside cover and back cover. This is so that you can glue the outside covers to the inside covers (you’ll need to print two of those), to make a more “finished” looking diary and provide extra durability. You may even choose to laminate the covers (just double-check it’s okay to bind through laminating at your chosen store). I chose to stick all the important stuff up front, where I can access it easily. The Title page is a great way to identify you as your planner’s loving owner. If you happen to lose it, you’ll want it returned ASAP so basic contact details go here. The Important Information page is next up, and contains info-at-a-glance. Jot down crucial notes on student particulars, such as allergies and special needs. Write the extension numbers and email addresses of school admins and specialist teachers. This is a really great page for general information. You may like to also include one of these pages in your Relief Teacher Folder for days you’re absent. The Contacts page is a quick reference for important contacts. It includes 27 spaces, which is great for parent contact for a class. If you have a larger class and require more space, simply print two to include. Keep track of your students’ birthdays with the Happy Birthday page (which is available in portrait and landscape orientations, to suit your preference). As with all of the resources in this pack, you may print these all off as PDFs and fill them in by hand, or download and save them as Word documents so that you can populate them digitally before printing. A blush blooms-themed title page for your printable teacher diary. A blush blooms-themed information page for your printable teacher diary. A blush blooms-themed printable contacts page to use as part of your teacher diary. 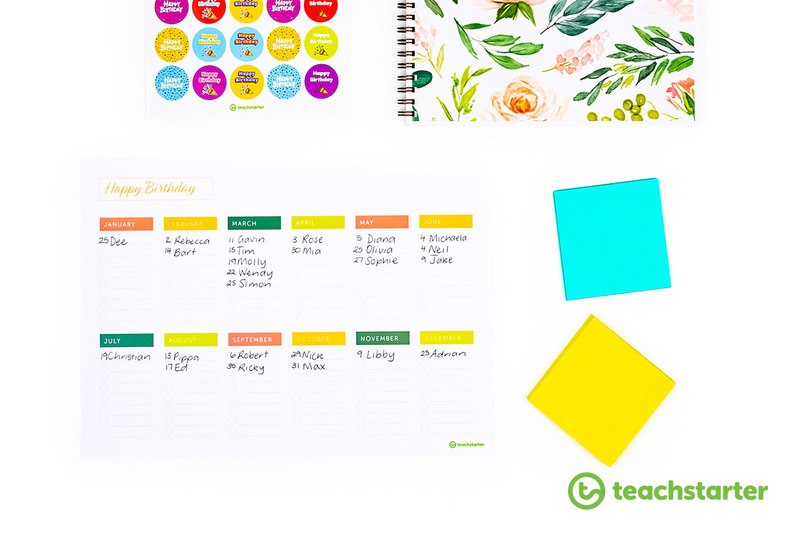 A blush blooms-themed printable birthday overview page to use as part of your teacher diary. 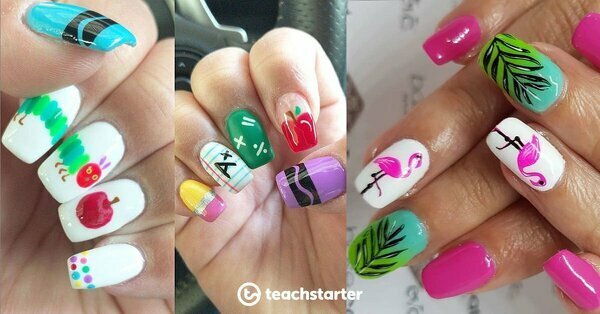 All teachers have their own individual planning styles. As a graduate Prep teacher I loved to plan on a daily planner, so that I could fit lots of plans, observations and reflections on each page during the day. Once I became more experienced and moved into higher year levels, I preferred to plan on a weekly planning sheet, in note form, and record assessment on my computer instead of by hand in my planner. The Blush Blooms Teacher Diary Resource Pack provides several options for varied planning preferences, which truly makes it the best teacher planner ever! I decided to print the Term Dividers on heavier card stock to clearly define the four terms’ planning. After each divider I included a Term Planner (these are conveniently available in 9, 10, and 11 week term versions, so you can select the ones you’ll need this year by checking out your state’s term dates). Next, I printed the number of Weekly Overviews I’d need per term. In 2019, Queensland’s State Primary Schools have four beautifully even ten-week terms. If you prefer to plan daily, you’ll need to print off the Day Planners for each week of each term. Your diary might be a bit bulky, so consider making a term-by-term diary (more info in tips, below). Blush blooms-themed printable term divider pages to use as part of your teacher diary. Blush blooms-themed printable term planning pages to use as part of your teacher diary. A set of blush blooms-themed printable weekly overviews to use as part of your teacher diary. A set of blush blooms-themed printable day planners to use as part of your teacher diary. Right up the back, I included all of my Assessment Trackers for recording student progress. When teaching, I always found I needed a HEAP of these! We’ve also designed notes pages in both lined and blank versions. So if you’re a list-lover, go with the lined, and if you’re a sketcher, go with the blank! Or mix it up like I did and do half and half! Also included in the Blush Blooms Teacher Diary Resource Pack is a Professional Development Record page. Print off a few for the back of your planner to record all of your professional learning to count towards your CPD points for your registration. A blush blooms-themed printable blank notes page to use as part of your teacher diary. 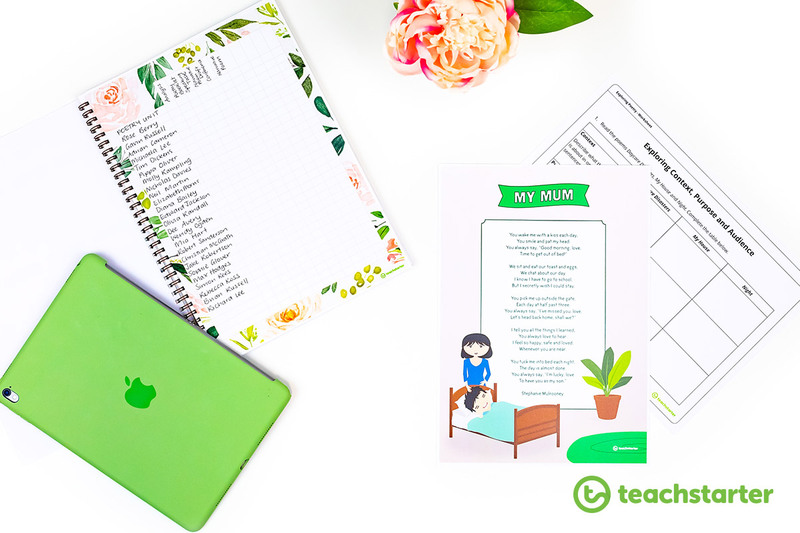 A blush blooms-themed professional development record for your printable teacher diary. After printing off and collating all of my pages in the order I preferred, I took everything to my local Officeworks to have my planner bound. For around $6 I had it covered in clear plastic (front and back), and bound in a copper metal coil. Binding your planner will protect it, extending its life, and offers a professional, beautiful finish at a low cost. If you’re using the Day Planner sheets, you might like to make a teacher planner for each term. Some companies who provide binding services will only bind a limited quantity of paper. This also saves you lugging around a thick diary, and gives you flexibility should you decide to make changes throughout the year. Some of our clever members use the planning sheets digitally, by downloading them to their devices and using a stylus to write in their information and planning. Day Planners make really great relief teacher instruction sheets! Print off some sets to have on hand in case you need to take time away. Keep a separate plastic sleeve of Assessment Trackers (pre-filled with your students’ names) to use as class lists. These come in super handy on excursion clipboards, for permission slip return tracking and as makeshift rolls when a relief teacher visits. So what are you waiting for? 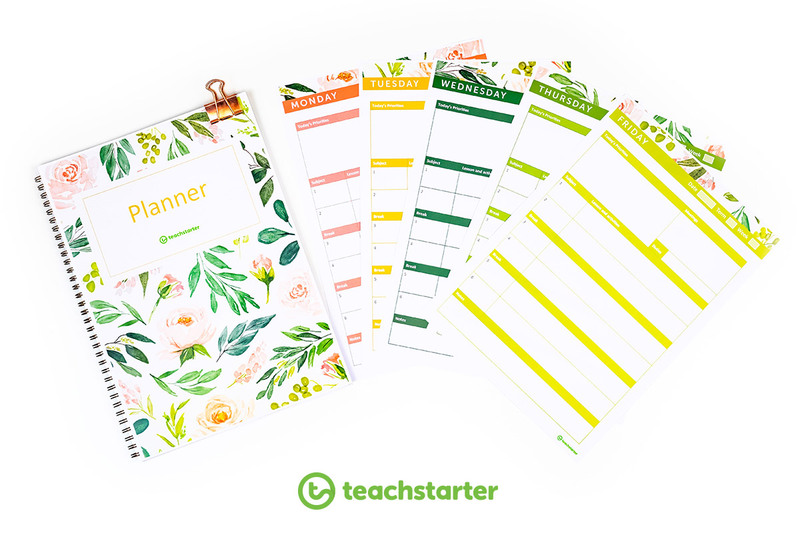 Hop on the Blush Blooms bandwagon now, and create your best teacher planner ever with a little help from Teach Starter! We love fantastic feedback. Thanks, Jenny!